- To provide the public with rapid and reliable information on urban air quality. - To monitor compliance with European Directives and local statutory instruments. - To assist in developing new policies. The instrumentation deployed was selected to meet the data quality objectives within the European Air Quality Directives and national legislation. 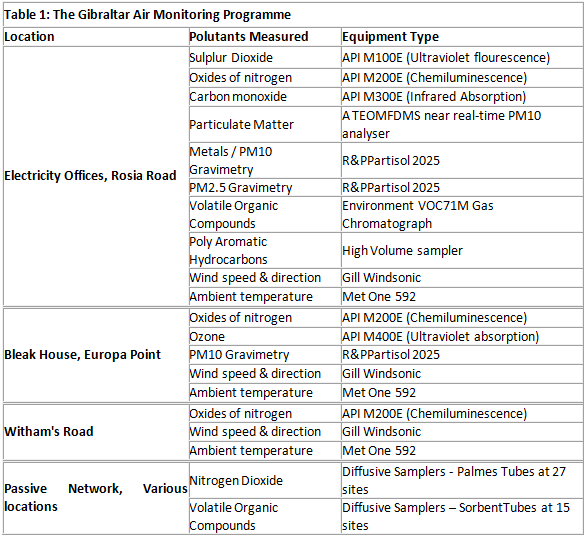 The monitoring equipment itself forms only one aspect of the overall Gibraltar Air Monitoring Programme. Appropriate maintenance and support, coupled with a well-designed and managed quality control regime ensures that the raw monitoring data obtained are successfully processed, analysed and interpreted in order to provide information and ensure compliance requirements under the Air Quality Framework and Air Quality Daughter Directives. Gibraltar air pollutant measurements are underpinned by a rigorous quality assurance and control programme. The non-automatic network consists of a diffusion tube programme for Nitrogen Dioxide and Benzene, Toluene and Xylenes (BTX) as well as three partisol filter (Gravimetric) units which are used to monitor particulate matter (PM10 & PM2.5), Lead, Arsenic, Cadmium, Nickel and Poly Aromatic Hydrocarbons (measured as Benzo(a)pyrene). In addition to meeting the Gibraltar Government's monitoring obligations, the data itself is disseminated in near real-time on the www.gibraltarairquality.gi web site.This web-based dissemination and reporting forms an important tool for delivery of air quality data and provides descriptive statistics to a broad range of end users. The term "Persistent Organic Pollutants" (POPs) refers to a diverse group of chemicals which are toxic, persist in the environment, bioaccumulate in fatty tissues and biomagnify through the food chain. In addition, POPs have the potential to be transported long distances and deposited far from their place of release. Consequently, POPs are found in pristine environments such as the Arctic and Antarctic. POPs have been identified as priority chemicals for action for many years. The international community has therefore called for actions to reduce and eliminate their production, use and release, via the mechanism of the Stockholm Convention on POPs. The Stockholm Convention on Persistent Organic Pollutants (POPs) entered into force on 17 May 2004. it is a global treaty signed by 178 states and regional economic integration organisations with the objective of protecting human health and the environment from persistent organic pollutants. HM Government of Gibraltar's continuing goal is to protect human health and the environment from the risks posed by POPs and to reduce the total releases derived from anthropogenic sources of each of them. Over the past decade, HM Government of Gibraltar has taken steps to identify, quantify and manage the major sources of unintentional releases of dioxins, PCBs, PeCB and HCB listed in the Convention. This National Implementation Plan (NIP) sets out how we will implement our obligations under the Convention.